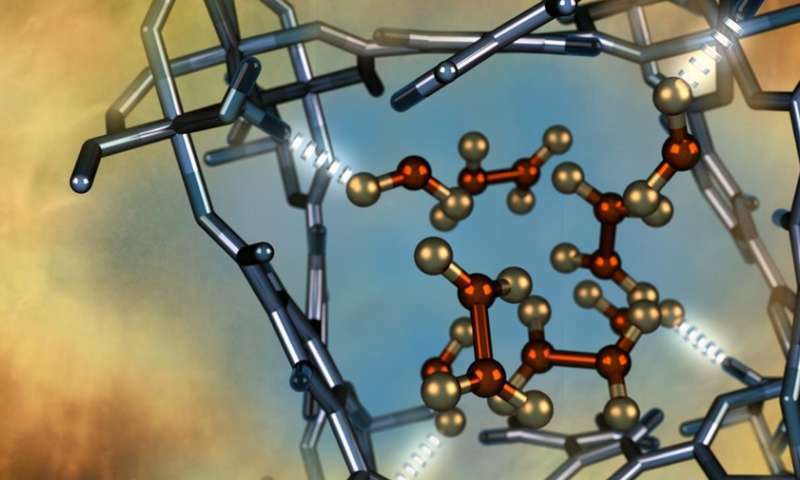 Led by the University of Manchester, an international team of scientists has developed a metal-organic framework material (MOF) that exhibits a selective, fully reversible and repeatable capability to remove nitrogen dioxide gas from the atmosphere in ambient conditions. This discovery, confirmed by researchers using neutron scattering at the Department of Energy's Oak Ridge National Laboratory, could lead to air filtration technologies that cost-effectively capture and convert large quantities of targeted gases, including carbon dioxide and other greenhouse gases, to facilitate their long-term sequestration to help mitigate air pollution and global warming. "This material is the first example of a metal-organic framework that exhibits a highly selective and fully reversible capability for repeated separation of nitrogen dioxide from the air, even in presence of water," said Sihai Yang, one of the study's lead authors and a lecturer in inorganic chemistry at Manchester's School of Chemistry. Professor Martin Schröder, another lead author from Manchester Chemistry, commented, "Other studies of different porous materials often found performance was degraded in subsequent cycles by the nitrogen dioxide, or that the regeneration process was too difficult and costly." As part of the research, the scientists used neutron scattering techniques at the Department of Energy's Oak Ridge National Laboratory to confirm and precisely characterize how MFM-300(Al) captures nitrogen dioxide molecules. "Neutrons can easily penetrate dense materials and they are sensitive to lighter elements, such as the hydrogen atoms inside the MFM, which enabled us to observe how the nitrogen dioxide molecules are confined within the nano-size pores," said Timmy Ramirez-Cuesta, a co-author and coordinator for the chemistry and catalysis initiative at ORNL's Neutron Sciences Directorate. "We benefitted from the extremely high sensitivity and quantitative data provided by the VISION vibrational spectroscopy instrument on ORNL's 16-B beamline at the Spallation Neutron Source, which uses neutrons instead of photons to probe molecular vibrations." "Computer modeling and simulation played critical roles in interpreting the neutron scattering data by helping us connect subtle changes in the vibrational spectra to interactions between the MFM-300 and trapped molecules," said Yongqiang Cheng, an ORNL neutron scattering scientist and co-author. "Our goal is to integrate the model with experimental techniques to deliver results that are otherwise difficult to achieve." Additional co-authors of the paper, titled "Reversible adsorption of nitrogen dioxide within a robust porous metal-organic framework," include Xue Han, Harry G.W. Godfrey, Lydia Briggs, Andrew J. Davies, Luke L. Daemen, Alena M. Sheveleva, Floriana Tuna, Eric J. L. McInnes, Junliang Sun, Christina Drathen, Michael W. George, and K. Mark Thomas.